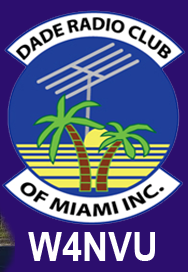 June 2012 Meeting Minutes – W4NVU – Dade Radio Club of Miami Inc.
Meeting was called to order at 19:30 with 33 present. We have a quorum. The minutes from last month’s meeting were submitted but not posted online and will approve at next month’s meeting. Ray asked for a moment of silence for a silent key Steve Splawn. Treasurer’s Report – Esther gave the treasurer’s report and we have membership cards for the paid members. If you have not paid your membership dues, please do so. Website – Ryan advised that we now have an online store for membership, polo shirts, hamfest, etc. The new Tech classes will take place June 16, 23 and 30th. Club Elmer/PIO Officer is Frank. He needs a list of those attending field day and what equipment you will be bringing. He will notify the media for Field Day to see if we can get some coverage. It will take place at Castellow Park, located at 22301 SW 162 Avenue in Miami. There will be a pavilion with electricity. June 23 and 24, 2012 from 1400 to 1400. Get there early if you can. The rules for field day were explained. Philipe announced that Coral Gables Races is having their field day and training at the end of the UM campus in the filed where the helicopters land. Saturday only and no overnight. An alternate site will be near Alhambra Circle at the east end in the park. Badges for club members are on sale for $10.00 each. Please see Frank. He needs a few more to put in the order. Dave came in from the other room. He announced that Hector Corona passed his Tech last month and passed his General tonight. And Jose DeMaio passed his Tech. Congratulations Hector and Jose! Armando advised that the next Tech class may be hosted here at the EOC. Anyone interested please send an email to Armando. His email address is KG4LYD@gmail.com or you can reach him through Twitter. The classes will be 3 consecutive Saturdays June 16, June 23 and June 30 from 8:30 AM to 12 Noon. The last Saturday of the classes, you will break for lunch and come back and take the test. He has books from ARRL. Hamfest was discussed. Tom announced that anyone interested in helping to see him. He will send out a list of positions available. Miguel advised that he, Frank and Tom went to the Hamfest in Dayton to promote our Hamfest here in February. They talked to everybody and they knew who we were. He received some free baseball caps from Yaesu and he is giving them out tonight to all paid members. He only had to pay for the shipping. Ray made a motion for the club to pay for the shipping costs of the hats, seconded by Joanne. The motion passed. The individual repeater reports were skipped tonight. Miguel announced that those that are working are working and those that have been moved are either moved or being moved. The list is contained in the agenda. The 147.000 is still being worked on. The Digipeater is not working. It will be checked out. Carl gave his emergency report. He announced the various nets and that he needs someone to take over running some of the nets. The list of nets is contained in the agenda. We need a banner for the club so we can put it up at the various functions that we attend. He asked if anyone knows where the old ones are. It was announced that they were thrown out because they were damaged and not usable. We need at least 2 banners – 1 for the DRC and the other for the Tropical Hamboree. A motion was made to approve the purchase of the 2 banners for under $300.00 by Kent, seconded by Leonard. The motion passed. Dave is still working on a location for the D-star repeater. Miguel has the club shirts if anyone wants to buy one. They are $20.00 each are either white or blue. Armando made an announcement about the Red Cross. They are testing their satellite equipment. Broward will be tested tomorrow afternoon and Dade will be tested on Thursday. If anyone is interested, please see Armando. Miguel announced that our club is going to talk to John Troy KI4YUM tonight via Skype during the meeting. The club members participated in speaking with John via Skype and he gave a great presentation, as well as a lot of information. He gave a presentation on how to communicate through your ham shack remotely through you phone. His company had an article in the May issue of QST magazine. He also took questions from the club members present. Miguel asked if there was any other new business. Virgil has a few items he gave out and sold for a donation to the club. Miguel thanked everyone for coming. A Motion to close the meeting was made by Frank, seconded by Hollis. Voted and passed. The DRC meeting was adjourned at 20:50.